Imagine hanging signs around your home that include words such as honesty, integrity, and respect while expecting those virtues to magically rub off on your children. It sounds absurd, doesn’t it? Teaching your children how to respect others takes a lot more work than simply hanging a sign on the bathroom door. If you’d like your children to learn respect you’d probably start off by showing respect to them and others. Over time, your children will recognize that your actions match your values. As foolish and ineffective as hanging signs around your house sounds, it’s exactly what executives at Enron did to the employee parking garage. Each floor of the garage was decked out in signs that included Enron business virtues such as ambitious, undaunted, innovative and smart. I came across this fact while listening to the audiobook, “Anatomy of Greed” by former Enron trader, Brian Cruver. 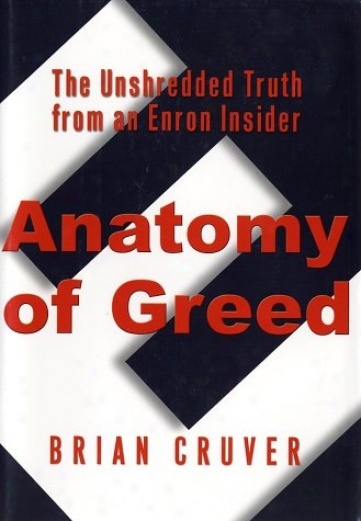 “Anatomy of Greed” is the fascinating story of how Enron executives took financial short cuts and thought they were above the law. Masterminded by Jeff Skilling, they decided the laws of accounting did not apply to them because they were smarter than everyone else. The downfall of Enron proves that all it takes is a handful of crooked individuals to bring down one of the most admired companies in the world and kick thousands of employees to the curb. Of course, Skilling saw it coming and, like a rat, jumped ship before the company sunk, but not before he cashed out Enron stock worth several hundred million dollars. He’s currently serving a 24-year prison term. Clearly the signs around Enron had no influence on employee behavior. In fact, employees began to mock the virtues at meetings and around the water cooler. And it’s easy to understand why: employees don’t want to feel like they’re being brainwashed. I’m reminded of a manager who demanded each employee hang a sign on his or her office door inscribed with the company’s values. Of course, there was as much enthusiasm to hang the sign as there was to attend a mandatory company party. Nobody wants someone else’s values shoved down their throat. My favorite memory of this experience was how this same manager attached a values sign to one of the main doors using white athletic tape. No frame. No push pins. Just two-inch wide athletic tape. Each day I wonder what virtues I’m passing on to my children. And even “passing” is probably too strong a word. I hope they recognized, through my example, what virtues I try to live each day. If I’m lucky, maybe they will pick up a few in time. As for the athletic tape, I’ll save it for wrapping my aging ankles.